Water is one of the most sought and needed natural resources. Of the entire world’s water, only 0.03% of water is available to us as fresh water. Water is a renewable but a finite resource.Climatic changes, increasing population, rising energy demands, haphazard urbanization, higher cost of water management, environmental degradation, natural disasters and military conflict are giving water resources increasing pressure. Water security is very high on the government, public and business agenda. Water is related to food security that addresses basic sanitation, drinking purposes and access to safe and healthy foods. In a 2012 survey by the World Economic Forum, water supply crises were listed as the second ranked global risk after major systemic financial failure, and ahead of food shortage crises, chronic fiscal imbalances and extreme volatility in energy and agricultural prices (Secretariat of the Convention on Biological Diversity , 2013). Water-related problems are particularly acute in Asia. Almost two-thirds of global population growth is occurring in Asia, where the population is expected to increase by nearly 500 people within the next 10 years (Asia Society, 2009). With increasing in population & climate changes the problem is likely to worsen. According to the Intergovernmental Panel on Climate Change, by 2050, more than one billion people in Asia alone are projected to experience negative impacts on water resources as a result of climate change. Experts project that reduced access to fresh water will lead to a range of consequences, including impaired food production, the loss of livelihood security, large-scale migration within and across borders, and increased geopolitical tensions and instabilities (Asia Society, 2009). Water scarcity can trigger famine especially in arid regions where people depend on water for irrigation, agriculture for food and income. Over time, these effects will have profound impacts on security throughout the region. Water scarcity at Bhachek Village, Gorkha, Nepal. Villagers collect water from early in the morning and store it in the bottles. Local people, youth clubs & Aama Samuha's (Mother's Group) have knocked on the door of concerned authorities. They are hopeful about the prospect of water coming in their village in the next two years. There are already several examples of current and future water challenges- water disputes between hostile countries such as India and Pakistan, water conflicts in China’s villages and provinces resulting from agricultural and industrial pollution, inadequate waste-water facilities of Indonesia that has impacted Asian glaciers, which for many countries are the primary examples. The scope and scale of these problems demonstrate in stark relief that no matter how we approach water resources—whether it is on the basis of quality and quantity, or as the most potent manifestation of extreme climatic events—hydropolitics is likely to be a growing force in Asian security that will require a broader understanding of and strengthened institutional capacities for water governance (Asia Society, 2009). Studies from ICG (International Crisis Group) 2002 show that Central Asia is heavily dependent on irrigated agriculture. As of 2011, 60 %of the rural population in the region is employed by agriculture and related business (United Nations 2007a; Elhance 1997). In modern contexts, all definitions of Central Asia include these five republics of the former Soviet Union: Kazakhstan, Kyrgyzstan, Tajikistan, Turkmenistan, and Uzbekistan. Other areas sometimes included are Afghanistan, Mongolia, eastern Iran, and northwestern Pakistan, and sometimes Tibet in western China, the Kashmir region of northern India and northern Pakistan, and southern Siberia in southern Russia. There are diverse mountain ranges in Asia which are historically known as the ―roof of the world that have played a central political and economic role in this vast region of Asia. (Jailov, et. al, 2013). Studies from United Nations in 2007 showed that only 18 million of the 59 million hectares of arable land are cultivated because of water supply limits. This shows that in future water scarcity will be directly responsible for famine. Central Asia is rich in water resources. However, more than 90% of the water in this vast region is concentrated in Kyrgyzstan and Tajikistan, where the region’s two main rivers—the Syr Darya and the Amu Darya—originate (Asia Society, 2009). Kazakhstan, Turkmenistan and Uzbekistan have the largest proven reserves of oil and natural gas, while Kyrgyzstan and Tajikistan have approximately 90 % of the region’s hydro-power potential (United Nations , 2007a). 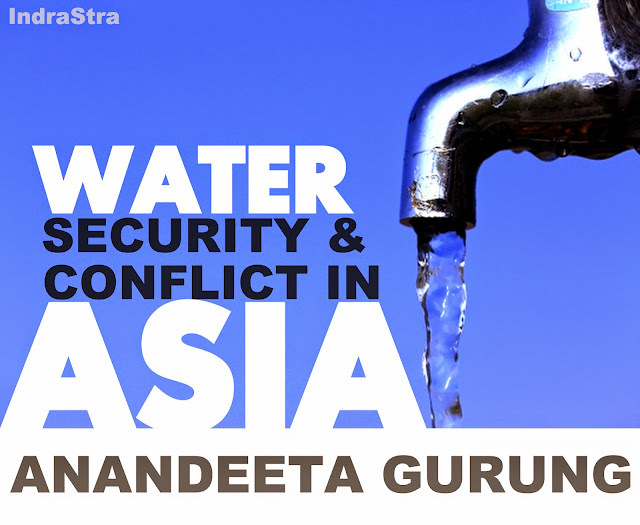 Among the region’s natural resource water resources is the most conflict-prone (United Nations, 2007b ). The main consumers are Uzbekistan and Kazakhstan, are responsible for consuming more than half of the region’s water resources, largely for agriculture. These two countries have the power to control the water needed by other Central Asian countries, which in turn view water as a means of strategic influence. Since the dissolution of the Soviet Union brought an end to the decades-old centralized system of water management, competition for water has been increasing at a troubling rate in Central Asia, a region that is already rife with political and ethnic tensions. Asia Society. (2009). Asia's Next Challenge: Securing the Region's Water Future. Asia Society- Leadership Group on Water Security in Asia. Jalilov, S.-M., Amer, S. A., & Ward, F. A. (2013). Water, Food and Energy Security: An Elusive Search for Balance in Central Asia. Water Resource Management , 3959-3979. O'Hara, S. (2000). Central Asia’a water resources: contemporary and future management issues. Water Resour Dev , 423-441. United Nations . (2007a). Central Asia: background paper on climate change. Human Development Report 2007/2008, Human Development Report Office Occasional Paper. United Nations. United Nations. (2007b ). “Water critical resource for Uzbekistan’ future, Publication in support of the Millennium Development Goals: ensure environmental sustainability United Nations Development Program,”. Tashkent: United Nations.